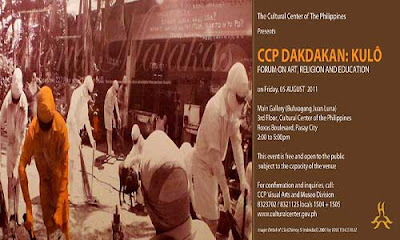 Everyone is invited to an art forum called Dakdakan on August 5, 2011 (Friday) at 2-5pm to be held at the Bulwagang Juan Luna (CCP Main Gallery). This forum will discuss the works featured in the exhibition dubbed as Kulo. Admission is FREE. An open forum on KULÔ is an exhibition of artworks by selected alumni artists of the University of Santo Tomas. The artworks, old and new, contribute to the discourses of the pen and the sword, education and revolution—topics that have implicated Filipino thinkers and artists, who are conscious of the historical occasion and dialogue between Jose Rizal’s 150th birthday and the country’s oldest university’s 400th year celebration as an educational institution. One of the works, Poleteismo by Mideo Cruz, in Kulo has sparked a controversy and elicited protest from individuals and groups, calling for the removal of the work and even closure of the exhibit. Two constitutional rights have come into collision through this issue. On one hand is of course the artist’s freedom of expression, against which stands the complaint that the artwork is deemed to discriminate against religious belief. In recognition of such valid concerns, the CCP has organized this open forum. Educators, representatives of religious organizations, art practitioner and experts on culture and law will be invited to set the points of analysis and study with the aim of promoting exchange, and more importantly, the commitment for tolerance in both areas of art and religious practice. Dakdakan is an educational program of the CCP Visual Arts and Museo Division. The forum is free and open to the public, within the recommended capacity of the venue. Confirmation and seat reservation are encouraged.